The heart of a dog is the same, no matter the size of its physical body. 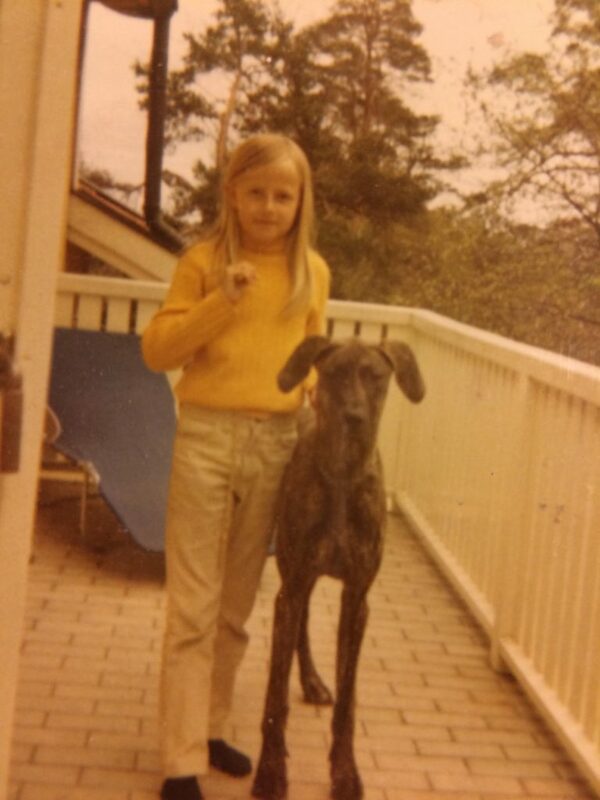 When I was 8 my mum and dad bought a Great Dane puppy. Peggy lived with us for 5 years, before suddenly choking before my very eyes in our hallway. The theory is that she inhaled nitrogenous gases from the neighboring lot. They were building a new house, and there had been dynamite explosions during the previous day. Quite a shock for the 13-year old girl I was at the time! Peggy was a sweet and gentle dog. She loved everyone, except for dachshounds. She was probably afraid of them, although we interpreted it as aggression. We could never figure out why she went nuts at the sight of one. Did she perhaps have a traumatizing experience involving a dachshound when she was a puppy? Only she knew. During our road trips to the winter cottage, I and my two siblings groaned when her sharp elbows massacred our thighs in the back seat. Although small in her own mind, she weighed a whopping 130 pounds. 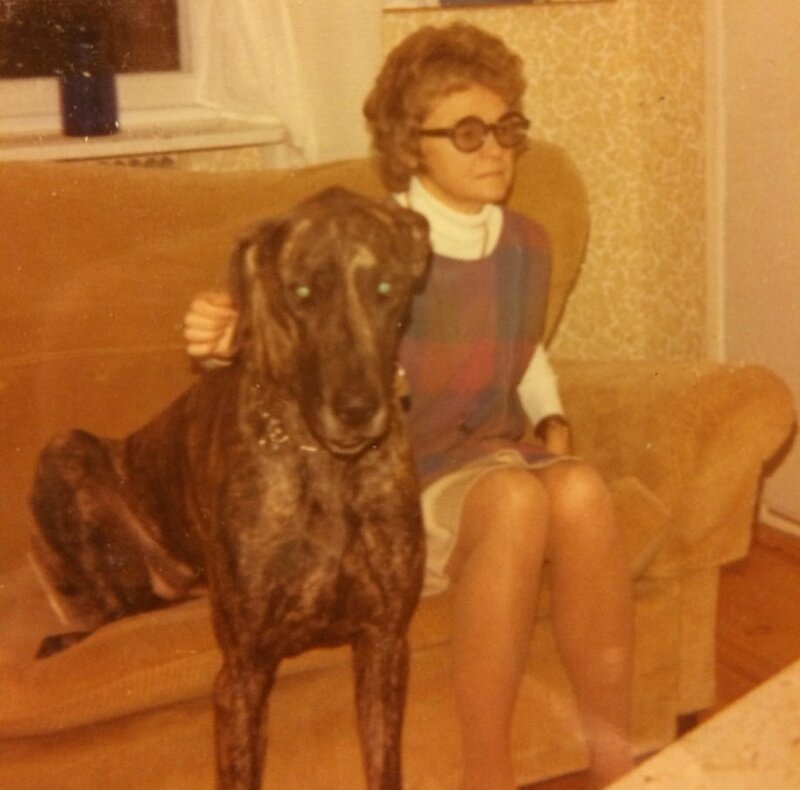 She was a lap-dog. Not kidding here. Although her size was a bit of a predicament for her, she found her own way around that. She simply placed her rear end including her hind legs in the sofa or the lap at hand and left her front legs on the floor. Problem solved. One would have thought her front legs would protest after a while, but she could stay in that position during an entire movie. On my chin, I have a small scar to remind me of Peggy for as long as I live. Of course, I would remember her anyway, but the scar makes me smile. It was acquired during a playing session in our living room. I’m not sure exactly how we played, but I think a tennis ball was involved. Anyhow, Peggy ecstatically bounced up and down, and given her height and mine not yet impressive length, the top of her head hit me on my chin. Great Danes have very hard heads. My skin actually ruptured and had to be taped. I instantly forgave Peggy for the accident but after that I was very careful to keep a healthy distance between us when playing. Peggy once (I’m sure only by accident, how was she to know it was not for her?) ate a whole dough intended for cinnamon buns, not as Great Dane food. She (and we!) paid the price in the form of frequent outdoor visits during the following night in order to let the dough make its natural way through her digestive tract. It was a sad day for sure when she so suddenly left our family. Dear Peggy. She left us with happy memories and made us want another dog a couple of years later! Apparently, we liked having a large dog in the house, because our next canine family member was another giant breed. Not as stout as Peggy but with the same height. 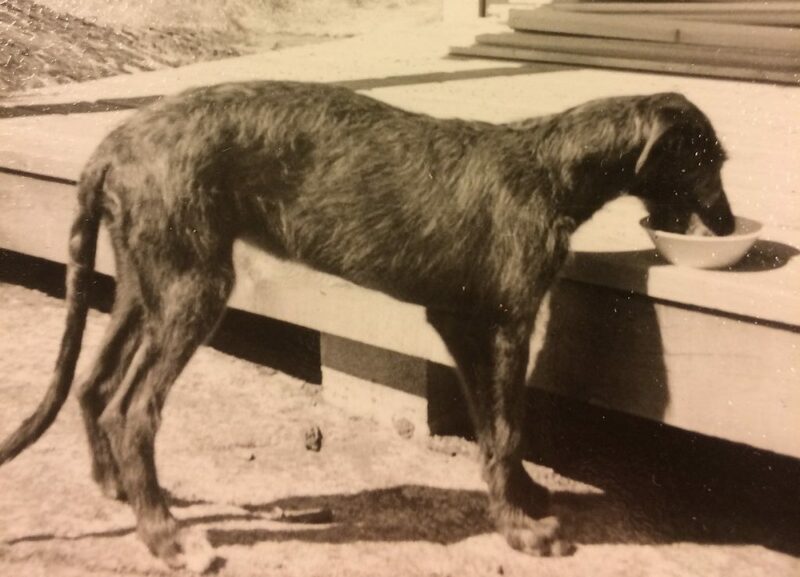 Ebba weighed “only” about 70 pounds, a slender giant with a dignified appearance. Her grey and shaggy coat gave her an impressive look, but she was as gentle as they come. She was “my” dog from the start. When she was a puppy she slept in a corrugated cardboard box by my bed to begin with. She quickly found out that tearing the paper from the corrugated part was a fun way to spend the early mornings when it was light outside but her closest pack member (me) didn’t show any signs of getting up. Soon enough she slept in my bed, and there she stayed until I moved from home. After that, she slept in her own bed. Did she feel abandoned? I hope not. She was born in the spring. During her first summer, she grew quickly. We spent most of the summer in our summer cottage, where there was a porch. We placed her bowl at the edge so she could eat outside, standing on the rock the house was built on. The ground sloped down beneath the porch, and as Ebba grew taller we moved the bowl so the distance between the porch and the ground increased. Convenient! Ebba loved boating. She stood in the fore, letting the wind blow her coat back. But she never bathed. Kind of like the old fishermen, who loved the sea but considered swimming in it an atrocity. Being a sighthound, she loved to run. I used to take her to a meadow in the woods close to where we lived and let her loose. She ran or rather raced in wide circles, and when she was done came back to me. Ebba also suffered a sudden death, though not as brutal as Peggy’s. One afternoon my mum suddenly heard a heavy thump from the second floor. She ran up the stairs and found Ebba lying motionless on the floor. Our darling Ebba died from acute heart failure. Scottish Deerhounds are prone to several types of heart problems, although they are generally speaking a healthy breed. Ebba died at the age of 7, just below the average life span of 8-11 years for Scottish Deerhounds. It took my parents a few years of indecisiveness but they finally decided to get another dog. 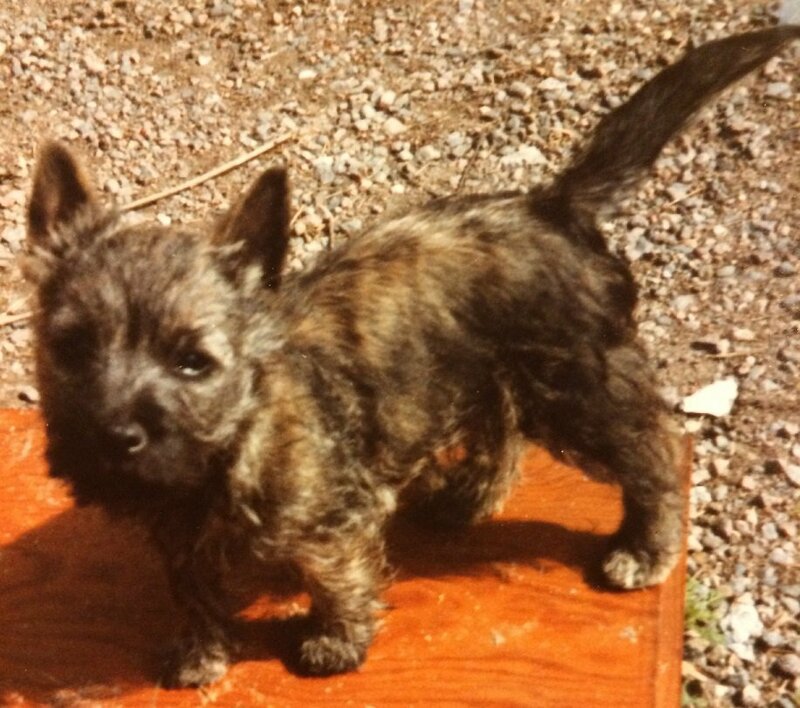 This time they went for a smaller breed, a sturdy and healthy Cairn Terrier. 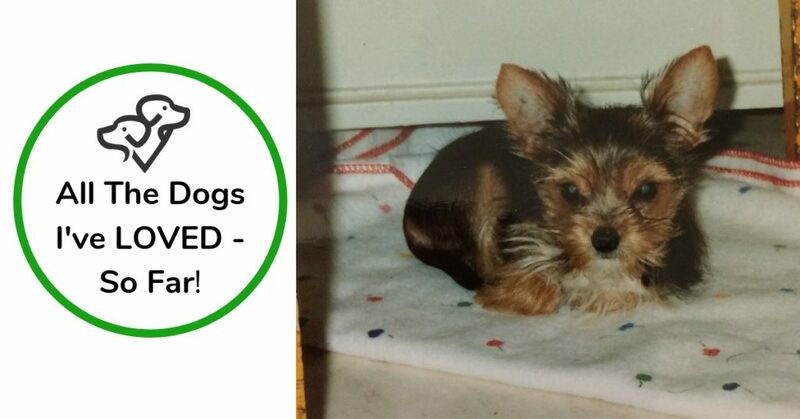 As it happened, my parents were away on a longer journey when it was time to fetch puppy Emma from the breeder. I received the assignment to pick her up and take care of her until my parents came back. She was a lively, friendly and easy dog from the start. Even though she only stayed with me for about a week, she was for the rest of her life more excited to see me than anybody else visiting my folk’s house. I believe this was because I (and my husband) was the first pack she became a part of after she left her mum at the breeder. Emma’s best friend for many years was Leo the Boxer. They went for long walks in the woods with their humans (my mum and her friend). Leo died before Emma, and she looked for and wanted to wait for him at their usual corner for a long long time after that. Emma was an avid outdoor eater. She ate anything and everything that appeared edible. When she was only a couple of years old she ate some kind of tiny poisonous mushroom in our garden while my dad momentarily looked the other way. This caused some sort of damage in her digestive tract, not entirely sure exactly how. Whatever it was, she ended up needing lifelong medication and a special diet because of it. The medication had one troublesome side effect. Emma’s eyes got all dried up, her body no longer produced tears to keep the cornea moist. Emma risked becoming blind. To solve this issue, surgery was performed. The aim was to create, or rather relocate, a canal from her salivary glands to the corners of her eyes. The surgery was successful, and alas, Emma’s eyes were moistened by her own saliva. Saliva and tears are not the same though, I think we can agree on that. Tears are composed of thin fluid, while saliva is rather thick and gooey. And that was what Emma’s eyes became too, gooey. For the rest of Emma’s life, my mum had daily sessions cleaning her eyes so they would remain clear. Emma patiently endured this treatment, knowing that at the end of it she would receive some well-earned treats. In stark contrast to Ebba, Emma hated boating. By this time, my mum and dad used our boat to travel out the island where we had our summer cottage. The journey with our small boat took about 2 hours. Emma howled a-l-l the way. Just imagine. As soon as they landed by our small pier, she quietened down and happily jumped ashore. In spite of her health issues, Emma lived to the ripe age of 16 years. When she was too tired to crawl out of the bathroom closet she had used as her den for many years, my parents had to face the heartbreaking truth. It was time to let Emma go. The vet came to our house and gave her the final shot. She was buried in the garden, and a flowering bush was planted on her grave. Emma was my parent’s last dog. Oh Ellen, I still miss you. I fell instantly in love with her. She was a part of our family for 14 years, and she was the dog my sons grew up with. She was as tiny as they come, she weighed only 5 pounds as an adult. 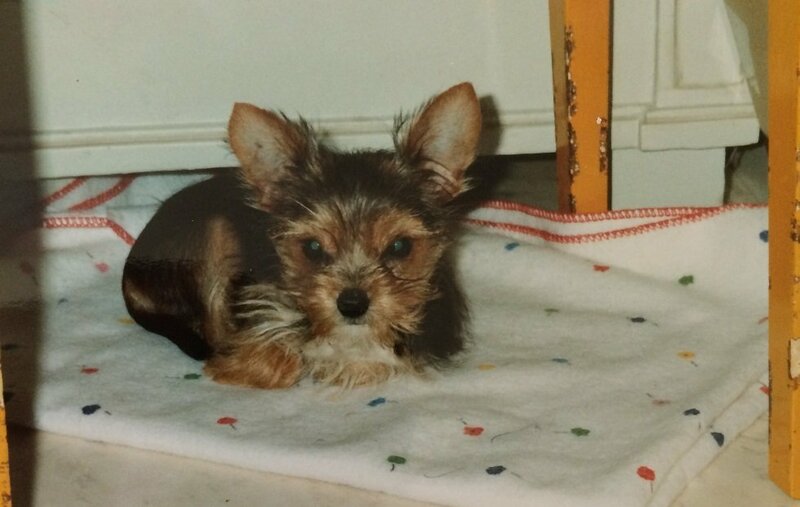 Her mum was a Yorkshire Terrier and her dad a longhaired Chihuahua. Her coat was the colors of the terrier (although the grey was solid black), but with the qualities of the Chihuahua. Did not grow endlessly, and was smooth and silky. My sister used to say she was like a Disney forest animal with her large ears and her big brown eyes. Ellen followed me and the family almost everywhere. When I was out jogging, she ran alongside me during the best years of her life. She loved walks in the forest. Since she was so small, it was easy to bring her with us. If it was inconvenient to let her walk or to carry her, she was easy to put in a suitable bag. Actually, that didn’t happen too often, despite her tiny size she was very much a dog, not a toy. At our summer cottage, she was always off leash and never left our side. Every morning she stood on the rock in front of the house and barked in every direction, just to let everyone know she was in place and they better stay away! When she was a few years old my sister got a kitten, and Ellen and Morris became friends. They took turns chasing each other until one of them grew tired of it and simply ended the game. It was a lovely little scene to behold. Ellen’s favorite food was pancakes. Yes, I know, not the best food for a dog. I knew that back then as well, so she could only have one when we had pancakes for dinner every other week or so. We cut the pancake in small pieces, and she bounced around in happy anticipation of what was to come. And then, as dogs do, devoured the pancake in half a minute. Gone! Once in a while, my parents took care of Ellen, when I had to go away where she could not tag along. This was when Emma was my parents’ dog. Emma was like a firm auntie to Ellen. She accepted her, but Ellen knew her place and never stood up against Emma. When Ellen was about 10 years old she got sick with a uterus inflammation. This is a common condition in aged, not spayed female dogs. The vet mentioned removing the uterus, but I chose antibiotics to cure the ongoing inflammation. I will always regret that. When she was 14, she once again suffered from severe uterus inflammation. Since she was still fit and seemingly healthy, the vet suggested surgery. This time I agreed. But she didn’t make it. The surgery itself was successful, but her kidneys couldn’t take the strain from it all. She stopped eating and became very weak and tired. She stayed for a few days at the animal hospital with an infusion drip, but to no avail. We brought her home, to spend time with her and let her be put down in her familiar surroundings. I didn’t dare let her sleep in my bed the last night like she always did since she seemed so vulnerable. I was afraid I would hurt her when turning in my bed. I laid her down in her small dog bed with a blanket to keep her warm, and let my hand hang down and touch her. The following day the vet came. Ellen lay in my lap while the barbitone made her fall into deep sleep, and then the lethal injection sent her across the rainbow bridge. 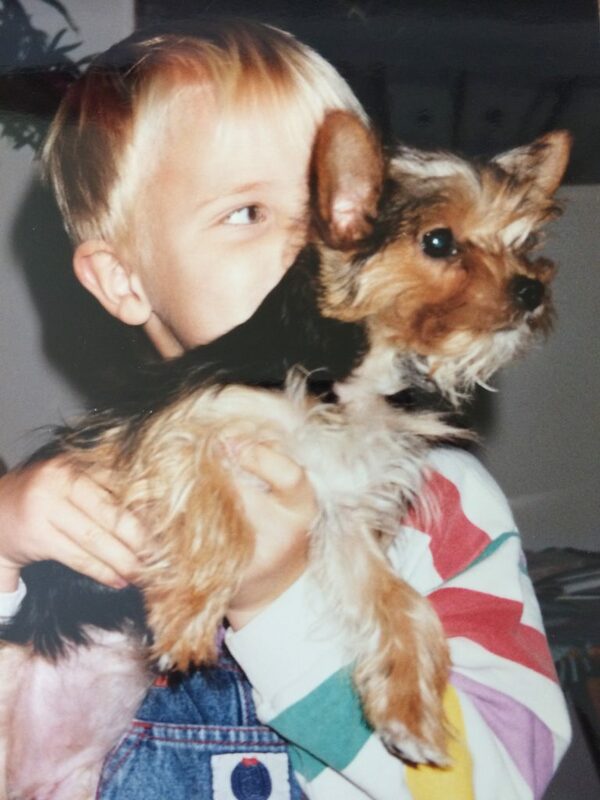 My sweet and loyal companion, my sons’ childhood buddy, was no more. I was devastated. We buried her in the woods behind our summer cottage, where she ran free but always stayed by our side. Ellen left us in early spring. In August of the same year, a divine creature joined our family. That was actually her name, Divine, but we quickly renamed her Dina, much easier to call. And Dina it was for 10 years. 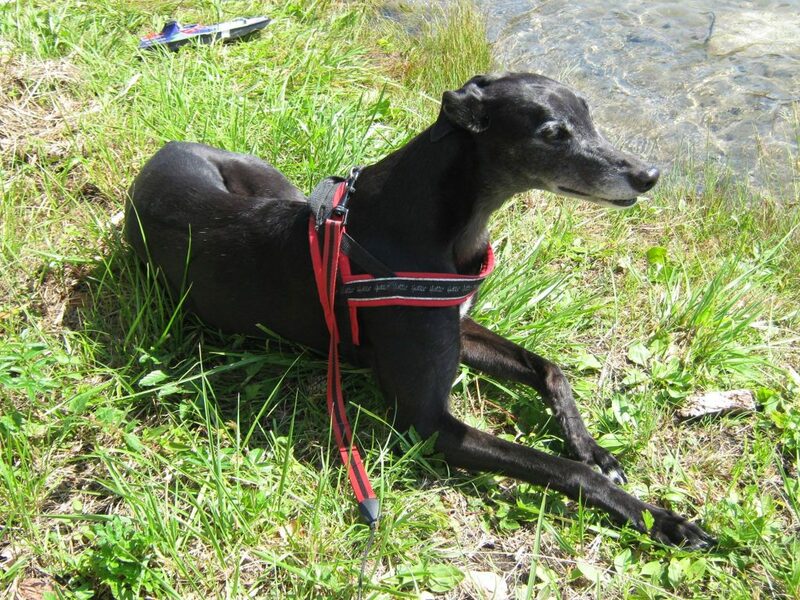 Dina was a 2 year old former racing Greyhound from Ireland. Even though we considered her extremely fast, she was not fast enough to win on the tracks. In Ireland, Greyhounds that do not perform well and earn money for their owners are treated like trash. Some get their ears cut off before being dumped in the countryside. That way they cannot be identified, since there is an identification number tattoed on the inside of the ear. Dina escaped that cruelty and was left at a dog pound. Hardly anybody wants to adopt a leftover race hound in Ireland, there a too many around. The only chance they have is to be found by some rescue organization visiting the pound and then being sent abroad for adoption. If that does not happen, their lives become sad and short. And that’s how Dina came to us. She was chosen for adoption and flown from Ireland, and we picked her up at the airport. She entered the waiting area in a large dog crate, that accidentally tipped over when unloaded from the cart. She must have been so scared! As soon as she was let out from the crate to be handed over to us, she crouched down and peed on the floor. A lot! Poor thing, she must have been dying to go to the loo. She did pee indoors a few times in the beginning, but I guess that was from confusion. Where had she come? Who were we? Was this just another short term stay for her? So much insecurity. On arrival, she was so skinny and with small wounds here and there on her body. Life in the pound must have been harsh. She was very food conscious to begin with, and once stole a sandwich right out of the hand of my then three years old daughter. Finally, she must have dared believe that she was a permanent member of our pack. Her food frenzy calmed down and she never again stole food. She was pitch black, except for some white marks on her chest and at the very tip of her tail. (Her tail was almost completely without coat when she arrived, so the little white tip didn’t show for quite some time.) As she grew older her head turned increasingly grey. At the end, when seeing her from a distance, it looked like she was wearing a grey mask. Dina was a calm and gentle soul. She hardly ever barked or jumped at anybody. She was easy to bring along, despite her size, since she was so calm. Like many Greyhounds, she never sat down. This is because of the large and tight muscles on their back ends. Some Greyhounds do sit, but many spend their lives standing or lying down. Dina was one of them. When she was 12, she suffered from a condition called megaesophagus. At the time I had never heard about it, and so I didn’t understand the symptoms. She vomited and coughed. The first veterinarian I contacted had apparently never heard about it either and thought she simply had a respiratory infection, perhaps bronchitis. As the days went by, she got weaker and I started noting that the food she regurgitated looked like it had just been eaten even though several hours had passed. I called the vet again but she dismissed that observation and now suggested kennel cough. A day or two after that, Dina one morning throw up last night’s dinner again, then went out into the garden and looked so distressed and unhappy. She had also lost a lot of weight. I knew I had to take her to the animal hospital right away. When we arrived they performed an x-ray of her chest, and she was admitted to a ward to get infusion drip. I hesitantly said goodbye and returned home with a knot in my stomach. At first they couldn’t quite figure out what was wrong with her. But two days after she arrived at the hospital a vet called and said she had scrutinized the x-ray images again and found what was missed the first time. Dina had an enlarged esophagus. I didn’t quite understand the meaning of this at first. I and my daughter went to the hospital, thinking we could perhaps bring her home. We found a very weak and tired Dina, lying in a kind of incubator to keep warm. We were told that the food she ate never reached her stomach, but stayed in the hammock the esophagus now was. We realized it was an impossible situation. That same night we sat with Dina as she was put down. Our beautiful gentle Dina stopped breathing with her head in my daughter’s lap. Now I know that a dog with megaesophagus can actually still have a good life. They have to be fed sitting up, like in a chair. The food needs to be liquid so it can easily flow down the throat to the stomach. I actually watched some kind of vet documentary where they built a “chair” for a dog with megaesophagus. This was a young dog with many years ahead of him. Could we have done that for Dina? Maybe. She was an adaptable and easy dog, but she was also old. Life expectancy for Greyhounds is 10-12 years. Dina was 12, and so definitely at the end of her life. Maybe it would have been too hard for her to adjust to those conditions. I don’t know. We had 10 wonderful years with her, and I believe she had a good life too. Perhaps it was time for her to go. Sweet darling Dina. Run free at the meadows in Rainbow Land. This article was quite emotional for me to write, I’m actually surprised at how much. Somehow they are all still there, in my heart, from giant Peggy to tiny Ellen. I’ve been crying more than once while writing this post. As wonderful as it is having a dog or two as part of our pack, there is also the built-in condition that their lives are so much shorter than our’s. The oncoming grief is inevitable. Is it worth it? Hell yeah! The love, the pleasure of being able to provide another living being with a good and happy life, it’s clearly addictive. There is a saying that a home without a dog is just a house. Once you have gotten used to having a dog around, I think that saying is very true. Every dog is a personality. It’s a privilege to have known all the dogs in my life so far! Dina was not our last dog, we now have two dogs in the family, Nelly, and Lola. I think they deserve a story of their own! PrevPreviousWhy Is My Dog So Fat? How To Keep Your Dog Slim And Healthy!